I have had an adopted rubber plant – I believe it is a Ficus Elastica for several years. It has a persistent case of scale. I have tried the following: wipe leaves regularly with rubbing alcohol, wipe with witch hazel, wipe with soapy water. mist leaves with all of the above. Currently I am misting leaves daily with soapy water (currently using a laundry soap called Linda Laundry soap.) To no avail!!! I still find brown and white scale on the leaves and sometimes on stems. This has been going on for years! Next, I am considering repotting the plant. It is still in the same pot and soil in which I found it. Maybe it is undernourished? Maybe the scale lives in the soil? maybe it needs a better pot? It came in a pot that is glazed and maybe the soil is not aerating enough? the plant is next to a large window – 8 ft x 12 ft in my live/work art studio. I have not isolated it from my other plants, mostly cacti of various sorts..But they do not show signs of infection. It does not receive direct sunlight but constant day light. The winter heat in my studio is erratic and dry. I run a humidifier. I have recently purchased a moisture monitor to make sure I am not over/underwatering it. but i find the monitor gives different reading depending on where I poke it in the soil. I fertilize it occasionally. I water it infrequently. Is there any hope? I am grateful for your expert advice! Rubber plants (Ficus elastica) are most commonly grown as houseplants. They may be attacked by a variety of bugs. To determine what should be done to kill them, you need to identify the bugs. Proper care of the plant will reduce the infestation severity and help the plant survive with little or no permanent damage. 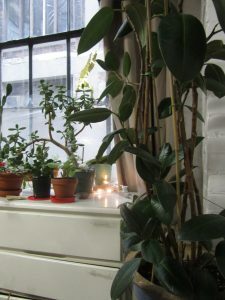 Rubber plant houseplants should be planted in a potting soil that drains quickly. The soil should dry slightly between waterings. Scale, or armoured and soft scale bugs are tiny insects that attach themselves to the stems or leaves of a rubber plant and remain in the same spot throughout their lives, feeding on the plant juices. Young scales or crawlers that have not attached themselves yet look like tiny yellow or orange spots. Armored scales do not secrete honeydew but soft scales do. They are commonly light tan but this varies depending on the species and life stage. Severe infestations can cause plant leaves to wilt, yellow and fall from the plant. If there is honeydew present it should be washed off. Scale insects are difficult to control because the waxy or cottony covering serves as a protective barrier to traditional contact insecticides. To rid your plants of scale, you may wish to remove them physically with your fingernail or some tweezers. Touching them first with rubbing alcohol on a cotton swab may help to loosen them but you should avoid covering the plant itself with alcohol. The following website provides quite a lot of good information on scale and its management. You may find this site helpful as well. Good luck with you rubber plant.